One of my goals with the Chag Notebook series is to tell stories from our global female Jewish community. To help me reach this goal, I contacted the Joint Distribution Committee, which works to help build Jewish life and leadership all over the world. They connected me with Danielle Flug Capalino a Registered Dietitian, Author, Consultant, Wife, Daughter, and new Mother living in Manhattan. I am a born and raised New Yorker. I work as a registered dietitian, consultant and author. I specialize in helping people with digestive issues so my friends joke that I help people with “Jewish guts”. I have a private practice, and also offer an online program called WTFodmap. I have written two books –Healthy Gut, Flat Stomach and the Microbiome Diet – with a third on the way. I am proud to be a board member at the American Jewish Joint Distribution Committee (JDC), which I joined as part of JDC Entwine’s innovative Global Leaders Initiative. “GLI”, as we call it, takes passionate and talented young Jewish adults, trains them to help respond to a myriad of global issues, and places them on JDC’s board of directors to ensure the organization can benefit from their expertise. Since then, I have increased my involvement even further. My family’s foundation is helping support Tikkun Olam Ventures (TOV), a groundbreaking new JDC project to help fight poverty among rural farmers. The organisation matches the farmers with Israeli agricultural technology, a philanthropic loan fund, and untapped markets. Vegetables have sprouted in Ethiopia and we have issued loans, deployed the Israeli drip irrigation systems, and some produce is already at market. I am also co-chairing a JDC food circle where we learn about and taste different ethnic Jewish cuisines. How do you connect to Judaism? 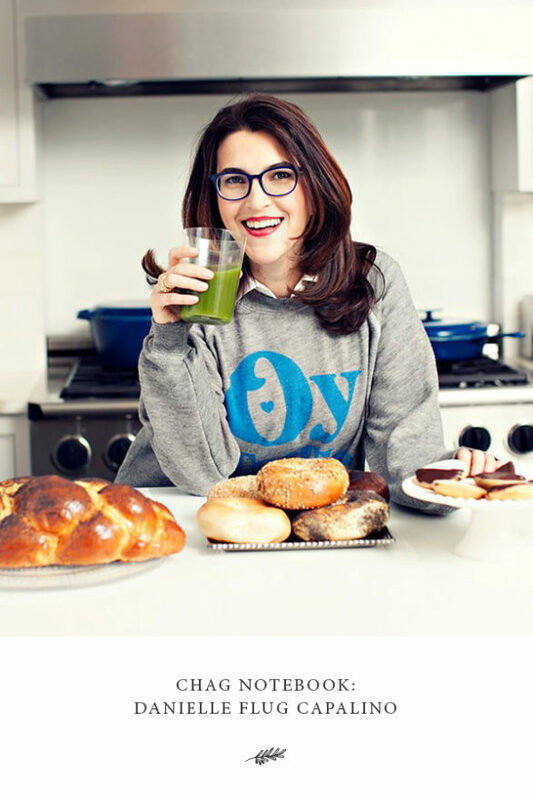 I connect to Judaism through philanthropy and through food. I have been very lucky that the idea of Jewish philanthropy was imprinted on me at a very young age by my grandfather Joseph Gurwin. My mother and I are honored to continue his legacy now through a foundation he established. Upon coming to the United States at the age of 16 on his own and losing his parents in the Holocaust, his major passion in life was helping Jewish people. On the other side of my family, my grandmother, Fortune Flug was an incredible cook who introduced me to Syrian flavors. I have Syrian cousins who I love to visit – they make the most delicious food! I feel like I can connect with my heritage through food and it is a connection that I want to pass along to my son. On the days leading up to my son’s birth, I participated in a guided mikvah session with a family friend through Immerse NYC. It was such an impactful experience, connecting me to Judaism and my son. I baked challah using a 5-pound bag of flour and recited prayers as I burned a piece of dough over a flame. My Syrian cousin gave me the idea to perform the ritual and it really showed me how much family, food, and religion are connected. How do you prepare to host people for a holiday meal or celebration? I started preparing for the major holidays on my own about four years ago. That first year I went to Kitchen Arts and Letters and asked for a Jewish cookbook. They responded and asked “what region of Jewish food?” as they had an extensive selection. My grandmother was from Aleppo and she was a fabulous cook so I am drawn to more Sephardic flavors (though I love pretty much all Jewish food). The first Jewish cookbook I bought was Jayne Cohen’s book Jewish Holiday Cooking. I have used the book for the past few holidays as the recipes are phenomenal! The recipes I remember making the first year were – a Moroccan brisket that was a 3-day process, Egyptian beans, and potato leek matzah balls. I had never made a brisket before and I was doing this by myself. I prepared it in a ceramic roasting pan and heated it on the stove (don’t try that at home). Once I realized the pan cracked in half, I had to think on my feet! How does the ideal holiday celebration look and feel to you? Passover is my favorite holiday. I am in charge of the food and my husband is in charge of the Seder readings. We try to incorporate more modern songs and readings in addition to our Haggadah. I think any meal that is cooked from scratch has beauty and meaning. The food is infused with love and tradition. Leading up to, during, and after the holidays, how do you reconnect with yourself? Personally, I reconnect with myself 100% through cooking. Every year now, I will take one full day before Hanukkah, Passover, and Rosh Hashanah, and cook by myself. It is a meditative experience and it makes me feel proud that I can carry on Jewish traditions. This year it is even more special, because it will be my son’s first time experiencing the Jewish holidays. What is one of your most memorable holiday experiences? The first year I made Passover I was nervous that my matzah balls were not going to work out (they did even though I chose an insanely ambitious recipe from Jayne Cohen’s book Jewish Holiday Cooking). I went to Russ & Daughters to buy some backups just in case, and while I was there I bought some gefilte fish. The night before my husband was hungry and I told him to have a matzah ball because we would have mine at the Seder. He gobbled away right in the kitchen and said how delicious they were. Well, my husband who claims to hate gefilte fish, totally ate gefilte fish thinking they were matzah balls. So – don’t write off any food based on what you think they might taste like! What’s your absolute favorite holiday dish? I love the Moroccan Brisket from Jayne Cohen’s book Jewish Holiday Cooking. I’ve gotten better at making it after a few years so now it is not as intimidating. Do you have any non-traditional holiday rituals or habits? What was something that your mother (or another influential figure) shared with you about the holidays that has stuck with you? What’s your number one tip or trick you’ve discovered that makes the holidays smoother, more positive and meaningful for you? Cook! I am not a professional chef and I taught myself how to make holiday food from a book with no pictures in it. The experience of preparing an entire meal from scratch has connected me to Judaism. Your turn: What will you remember from Danielle’s interview? Next What’s On Your Rosh Hashanah Playlist, Maya Ross?